Please refer to our stock # 3001 when inquiring. Rare Japanese textile, a fukusa, finely embroidered in colors and shades of gold, white, green, beige and brown, on black silk ground. Very finely executed in couched (overlay) gold metallic thread and satin stitch. 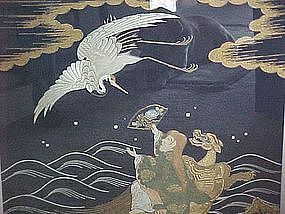 The fukusa shows on cloud and wave ground a sennin astride a long-tailed tortoise below a crane in flight. Crane and tortoise symbolize longevity in Japanese mythology. A fukusa is a covering placed over a gift at the time of gift-giving such as a wedding or a New Year celebration. Early Meiji (1868-1912). Fine condition. Framed: 34.5" x 38". Unframed: 25" x 27".